As many people know, our ears are not only responsible for our hearing, but also for our balance. Fluid-filled semi-circular canals give our brains information about where it is positioned in space, which allows the brain to make subtle corrections to our eye and muscle movement to keep us from falling over. Sometimes, when things go wrong in the semi-circular canals, people are left feeling a sensation of movement known as vertigo- classically a spinning feeling, but by definition vertigo is any perceived motion where there isn’t any. Inside the semi-circular canals are gel capsules filled with tiny crystals, or stones, called otoconia. When our heads move into a specific position, these crystals move in response, pulling on the capsule and sending a signal along the vestibulo-cochlear nerve to the brain. However, sometimes a few of these crystals are able to break free from the capsule. When this happens, anytime the head is in that specific position, the crystals move quickly around the semi-circular canal, causing movement of the fluid and over-movement of the gel capsule. The brain gets a mismatched signal, tries to compensate by causing the eyes to move, and causes vertigo which lasts for about a minute. 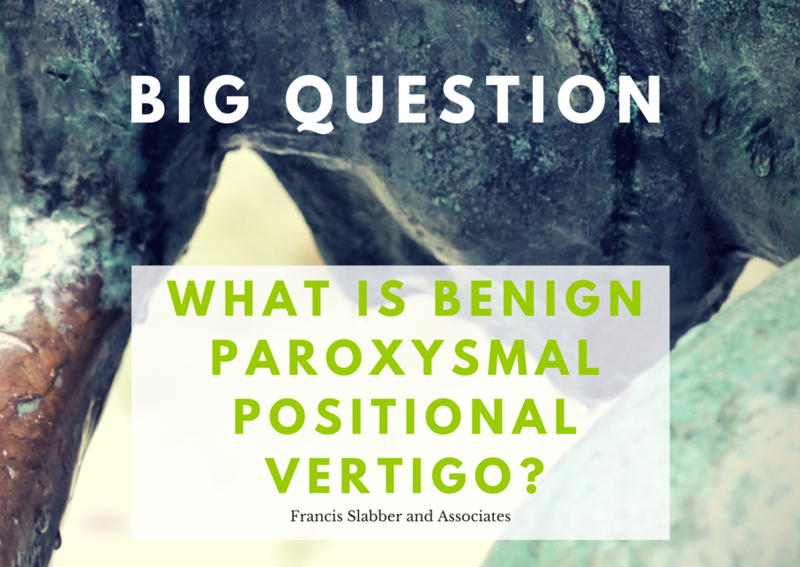 This condition is known as Benign Paroxysmal Positional Vertigo, or BPPV. BPPV is more common later in life, and more common in women, but it can happen to anyone. The classic symptom is a spinning sensation, lasting under a minute, when the head is in a specific position, often when turning over in bed. It can occur in any of the six semi-circular canals that each person has. Sometimes it can come about after a head injury (even a minor one), or after a viral infection, but sometimes we just don’t know why it happens. BPPV can be diagnosed by a primary health care provider such as a GP, by an Ear, Nose and Throat Specialist, or by an Audiologist or Physiotherapist with training in vestibular disorders. A positioning test called a Dix Hallpike is used to determine whether the condition is indeed BPPV, and to determine which canal is affected. The patient is helped to quickly lie down with the head and neck extended over the back of the bed or plinth, with the head held at a specific angle, to try and elicit the vertigo. This test should only be performed by a trained healthcare professional. If the right kind of vertigo is elicited, and we can determine which canal is involved, the healthcare practitioner will then attempt to ‘move’ the lose crystals to be reabsorbed into the gel capsule or the body. For the most common kinds of BPPV, this will be done using a Canalith Repositioning Procedure (CRP), or an Epley Manoeuvre. This is a continuation of the Dix Hallpike, where the person is slowly shifted through a series of positioned designed to cause the crystals to move into another area. These manoeuvres usually make the patient feel quite dizzy at the time, and sometimes need to be repeated before they fully ‘take’. If the person has serious neck problems that prevent the performance of the manoeuvre, or if the CRP is not successful, the healthcare provider will sometimes suggest exercises that the person can do at home to help the body adjust to the vertigo. Diagnosis and treatment of BPPV should always be done by or under supervision of a trained healthcare professional. If you suspect that you may have BPPV or vertigo, please speak to your doctor or audiologist about treatment and do not attempt to diagnose or treat yourself. For more information, please comment below or contact us.